One Big Happy Fame-ily is a soft lavender with a silver/lavender shimmer. This polish is gorgeous. Lilacs/Lavender shades are some of my absolute favorite colors come this time of year and heading into spring. The best part about this one is the shimmer. This is not a typical finish I've seen in many polishes in this color family. The color is soft, airy, and feminine. I love it. I'll just ignore the name! 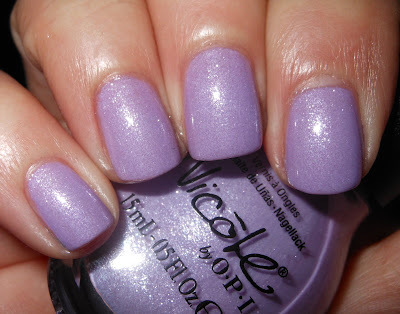 *I received this product to review from the Central Florida Beauty Bloggers via Nicole by OPI. Your rant at the beginning is truly the best. I feel the same way! This is a really pretty color though, I'm surprised it came from their line of polishes! I'm the same way when it comes to the Kardashian clan, the only one I can tolerate is Khloe. I've looked at their polish lines and liked a few of the colors, and I can't bring myself to buy one because of them. Lol! I feel the same way about the Kardashians. They are famous for doing absolutely nothing! I don't understand it. I'll admit I have one of their NOPI colours, Deck the Dolls from the winter collection. This is so soft and pretty! I am totally on-board with your feelings about the Kardashians...they drive me NUTS!! I love this color so much!! Why haven't I tried mine yet. I can't say that I HATE the Kardashians because I've never paid attention. I couldn't care less what they do. Same here! Literally the only Kardashian I "like" is Khloe. I think she's funny and I really do think her marriage is a rare thing. But Kim and everyone else... ugh. This makes me laugh, I own about 200 nail polishes and refused to buy hers....until the modern family line came out. That broke me. Not a Kardashian fan either, but they aren't the problem, the media that keeps following them is, as are the people that keep watching them. Somebody offered me tons of money for breathing, I'd take it too. I feel the same, and because of that I have never bought any from their any of their collections (kollections?). I refuse to give them any of my hard earned money. Plus I haven't seen any that haven't been dupeable. I have this color - it's really pretty! This is so funny because I was about to do swatches of Kardashing Through The Snow, but didn't know if I was up for a Kardashian disclaimer/rant. Why must the colors be so prettah?!? My love for a pretty polish has overcome my distaste for anything labeled "Kardashian" and so I have happily purchased several colors from NOPI that are from that collection. I am not a tv watcher and not a fan of fluff tv (reality shows) as I call it. Mindless, airheaded fluff with no real content or meaning. But anyway, I DO appreciate a pretty polish and especially if it's a color that I don't already have anything close to. Who cares about a stupid name? I love polish! Heck if names made me choose or not choose a polish then what about OPI's "Ut-oh roll down the window". That makes me both gag and giggle at the same time.